Alexandru Todea was born in the village of Teleac near Reghin (nowadays, in Mureş county). Being an Eastern Catholic, Alexandru studied theology at Blaj and at Rome, where he earned, in 1940, his PhD title in theology. In 1948 the Romanian Church United with Rome returned to the Romanian Orthodox Church, from which it was separated about 250 years earlier. Condemned during the communist regime to hard labor for life, he was pardoned in 1964. 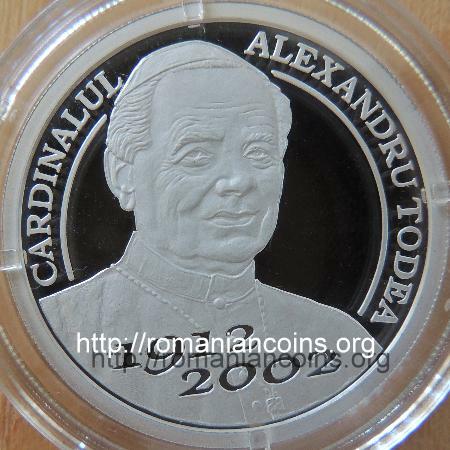 In 1990 the Romanian Church United with Rome, Greek-Catholic was reestablished, and in 1991 the pope John Paul II raised Alexandru Todea to the rank of cardinal of this Church. In 1992 Todea was elected honorary member of the Romanian Academy. 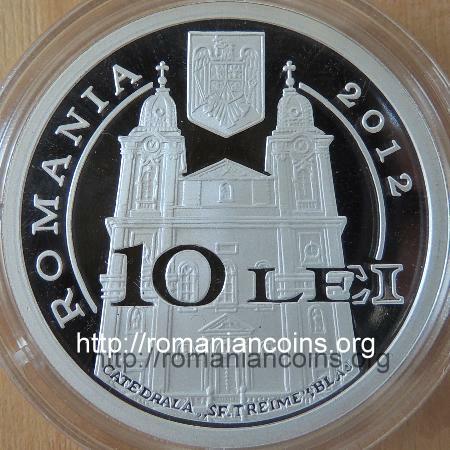 Another hierarch of the Romanian Church United with Rome, bishop Petru Pavel Aron (1709-1764), is represented on another Romanian anniversary coin: 10 lei silver 2009.